A great room design, this dramatic home features a formal dining room, a breakfast nook opening to the lanai, a gourmet kitchen, a butler’s pantry, a wine storage room, a study and a secret room. There is a large game room with a corner of pocketing glass doors that opens to another section of the lanai, creating a perfect combination for entertaining. The luxurious master suite includes two walk-in closets and “his and hers” baths joined by a walk-through shower. There is a sauna and an outdoor shower. The three guest bedrooms each have a private bath and walk-in closet. Two of the bedrooms also open onto a private walled courtyard with a sparkling water feature and an outdoor shower. This two-story estate residence features a drive through motor court with three-car garage. A unique feature is the guest house with living area, bedroom, kitchen and bath located above the garage with access by a second story arched breezeway. Other distinguishing architectural features include a wine cellar, butler’s pantry, intimate study, private elevator, octagonal casual dining area, wood beamed loggia, magnificent private terrace with a specious courtyard off the formal living and dining area, gourmet kitchen with casual gathering area and outdoor living room with summer kitchen. This masterful design provides great flexibility providing elegant master suites on each living level. Two additional bedroom suites are located on the second level. The grand foyer introducing an intimate living room featuring a semi-circular mitered glass wall looking onto lanais, fountains, pool and spa. A beautiful gallery with magnificent barrel ceiling provides access to all main living areas. 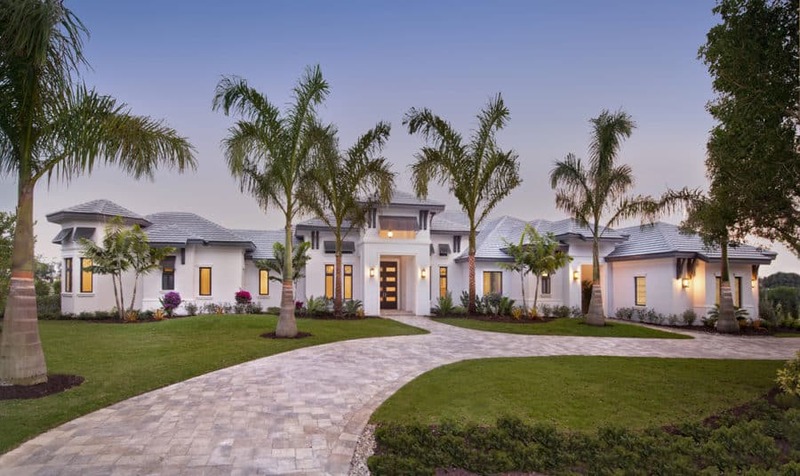 Designed for Florida living, the main family gathering areas are spacious, richly appointed with 10 foot zero radius doors opening to a tremendous outdoor living room with summer kitchen and fireplace. The master suite features a private terrace and bath offering state-of-the-art amenities and conveniences. The main living level also features a large guest suite with lanai. The upper level offers two additional guest suites that can be easily converted to a media room or gathering room with access to a grand covered balcony ideal for casual entertaining. An octagonal foyer with barrel ceilings welcomes visitors with a view of the pool and lazy river feature through the foyer picture window. The master suite includes a lovely vaulted ceiling sitting area with French doors opening on to the spectacular pool and spa terraces. Three spacious guest bedrooms surround the exterior of the home, with each featuring a private courtyard. Formal living and dining are just a step from the entry foyer. Family areas in the heart of the home offer casual living and dining rooms. The kitchen features an oversized island, tons of storage and specialty cabinetry. A butler’s pantry and wet bar allows for easy entertaining. The outdoor living space includes a spacious summer kitchen. This luxury home truly has it all. A gracious octagonal foyer welcomes visitors to this magnificent Mediterranean style home. The master bedroom suite includes a lovely vaulted ceiling sitting area with direct access to spectacular pool and spa terraces. Three additional spacious bedrooms each have a private bath. The Villa Brezza offers both formal living and dining spaces and more casual family dining and living areas.